MORGANTOWN, W.Va. (March 16, 2018) - Over the past 77 years, the first full week of March in Daytona Beach has meant motorcycles. Starting with the Daytona 200 in 1937, Daytona's Bike Week has grown into one of the biggest motorcycle rallies in the world, with events taking place over a ten-day period. Most attendees are there to enjoy riding on the streets, but there is a growing contingency of dirt bike and ATV riders that descend on Central Florida to kick off their race seasons. In the midst of Daytona's 77th Annual Bike Week festivities, there was plenty of racing action. Between the AMSOIL Grand National Cross Country Series (GNCC), the Ricky Carmichael Daytona Amateur Supercross (RCSX), and the FLY Racing ATV Supercross (ATVSX), more than 1,850 unique racers and their families and friends were on hand for the first half of Bike Week. All three events are AMA-sanctioned, bringing AMA members from all over the country and world to compete in the Daytona Beach area. 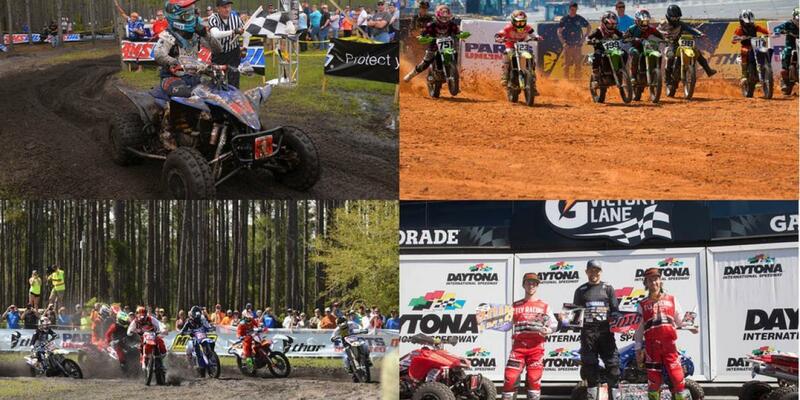 Thousands of AMA racers competed in Central Florida this past weekend. "The Racer Productions and MX Sports team looks forward to visiting Daytona Beach and Central Florida to race every year. The fact that we hosted nearly 2,000 racers and their families in the Sunshine State is an exciting way to start off the race seasons," said Events Director Tim Cotter. "We are honored that these AMA members and their families have entrusted us with organizing the disciplines they love and overwhelmed to see how far reaching our events can be with riders from nearly every state and many foreign countries. Central Florida and its ideal spring weather equates into the perfect mix to kick start the year." 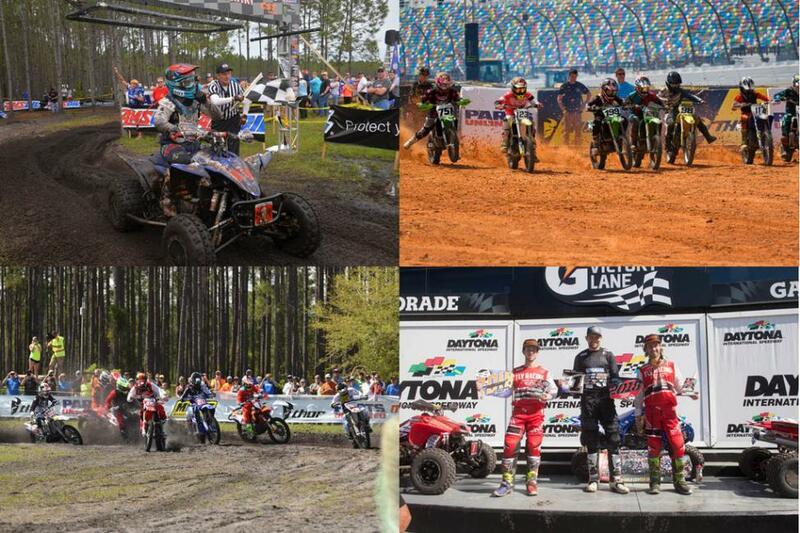 The GNCC series hosted its second round of the 2018 season in Palatka, Florida, one hour north of Daytona Beach on Saturday, March 10. After two hours of battling the rugged track conditions on ATVs, it was the reigning XC1 Pro National Champion Walker Fowler who continued his campaign, starting the 13-round season with back-to-back wins. With 320 ATV riders, the Wild Boar GNCC pits were full of racers eager to compete in America's premier off-road racing series. GNCC Racing hosted competitors from 37 U.S states and almost a dozen countries, including a group of over 40 racers and fans hailing from Puerto Rico. 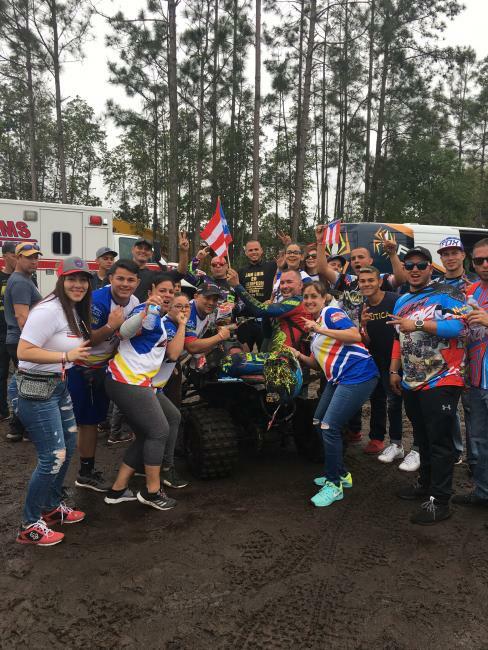 Over 40 racers and fans hailing from Puerto Rico joined the GNCC Racing Nation at the Moose Racing Wild Boar GNCC. On Sunday, March 6, the Moose Racing Wild Boar GNCC featured 687 motorcycle riders, including defending champion Kailub Russell and top competitors Steward Baylor Jr. and Thad Duvall who rounded out the overall podium. The same three riders were on the podium at round one just two weeks ago in South Carolina, with Russell taking top position at each. Meanwhile, back at Daytona International Speedway, dozens of AMA Amateur National Motocross Championship alumni participated in Saturday night's Daytona Monster Energy Supercross, including race winners Justin Brayton (450SX) and Jordon Smith (250SX). As soon as the checkered flag fell on the pros, the MX Sports and Daytona International Speedway teams began modifying the Ricky Carmichael-designed supercross track to make it suitable for riders of all ages and skill levels. While the Wild Boar GNCC was happening on Sunday, nearly a thousand amateur motocross racers were battling it out at the Ninth Annual Ricky Carmichael Daytona Amateur Supercross, which took place over the course of Sunday and Monday. The star power continued with up-and-coming stars Nate Thrasher, Ryder DiFrancesco, and Casey Cochran each winning classes. Monday, March 7, played host to the RCSX main events and the opening round of the Women's Motocross Championship (WMX). Florida native Kylie Fasnacht claimed the win and the points lead heading into round two of the eight-round WMX Series. Former professional riders like Greg Pamart and John Grewe were the big winners in the Vet class races. 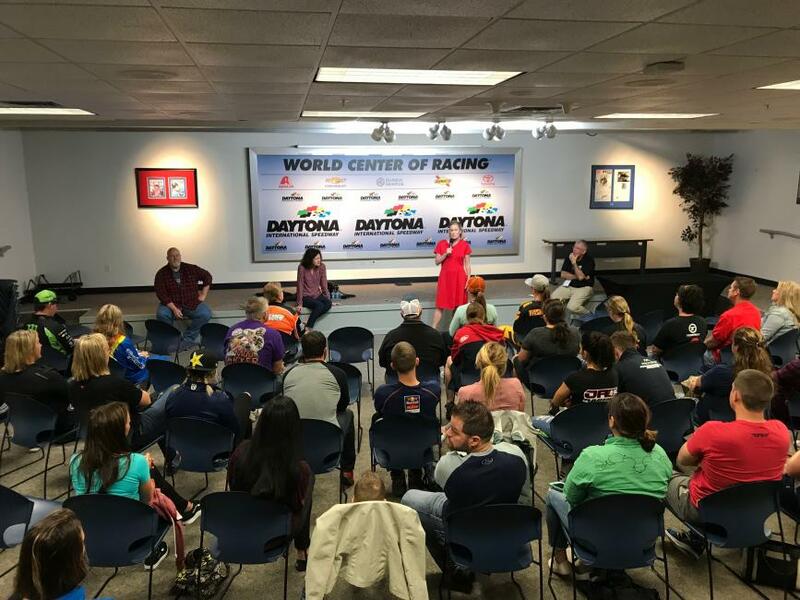 The inaugural Women In Racing Conference was held on Monday, March 7 at Daytona International Speedway with Lesa France Kennedy, CEO of International Speedway Corporation, making the opening remarks. There were 35 AMA Major Event number one plates awarded on Monday to the class winners, many of whom are currently in the process of qualifying for the 37th Annual AMA Amateur National Motocross Championships at Loretta Lynn Ranch from July 30th – August 4th in Hurricane Mills, Tennessee. Once all the two-wheeled action was completed, the track was turned over for the Fourth Annual FLY Racing ATV Supercross. This unique event serves as the opening round for the 2018 ATV Motocross National Championship, presented by CST Tires. With thousands of spectators on hand in addition to the over 200 race entries, five-time ATV National Champion Chad Wienen took the win, proving that he remains a top contender for the championship once again. The FLY Racing ATV Supercross brought down the curtain on what could be called Dirt Bike Week at Daytona: four straight days of racing in three different disciplines. By Wednesday afternoon, the RCSX track had been flattened in preparation for Daytona TT, which saw Jared Mees win his second consecutive race on the legendary tri-oval last night. For more information on MX Sports events, please visit https://mxsports.com/ or call (304) 284-0101. For additional information on GNCC Racing, please visit www.gnccracing.com or call (304) 284-0084. The AMSOIL Grand National Cross Country Series is America's premier off-road racing series. Founded in 1975, the 13-round championship is produced exclusively by Racer Productions. Cross-country racing is one of the most physically demanding sports in the world. The grueling three-hour GNCC races lead as many as 2,400 riders through tracks ranging in length from eight to 12 miles. With varied terrain, including hills, woods, mud, dirt, rocks, and motocross sections, GNCC events are tests of both survival and speed. The series draws talent from all over the U.S., Central America, South America, Europe, Japan, Australia and New Zealand. GNCC Racing is televised weekly on NBC Sports and RacerTV.com. For more information, please visit www.gnccracing.com. The Ricky Carmichael Daytona Amateur Supercross event is the world's largest two-day amateur supercross event. Hosted annually since 2010 at Daytona International Speedway in Daytona Beach, Florida, the class structure includes 35 classes from youth riders on 50cc bikes all the way up to vet and senior classes. The race follows a supercross format, using heat races and last chance qualifiers to seed the field of riders into the main event in each class. In collaboration with 15-time champion Ricky Carmichael this event is produced by MX Sports, Inc., a West Virginia-based race production company and sanctioned by AMA. For more information, please visit www.racedaytona.com. The Women's Professional Motocross Championship (WMX), an AMA National Championship, features the world's fastest female outdoor motocross racers. The 8-round series begins with the Ricky Carmichael Amateur Supercross at Daytona International Speedway in March and concludes with the Ironman National in August. These top female pro racers compete in a two-moto format on machines ranging from 125cc to 250cc. The WMX is managed by MX Sports Pro Racing, a West Virginia-based company and industry leader in power sports event production. For more information, please visit www.racewmx.com or call (304) 284-0101. The ATV Motocross National Championship, presented by CST Tires, an AMA National Championship, is the nation's premier amateur and professional ATV motocross series, hosted at top motocross facilities nationwide. The 10-round series features the Nation's best racers, teams and sponsors, and is America's largest and longest-running ATV national motocross program. Since 1985, the series continues to expand and produce top talent from the amateur ranks, while premiering the professional class. For more information, please visit www.atvmotocross.com.